I once had a white male co-worker ask me if when I had my hair pulled back it meant that I was in a bad mood. Given that I change my hairstyle so often- compared to a typical straight haired peer- I thought it was funny he worried about things like that. I told him that when I wash it I can do one of two things- let it dry big, or let it dry small, and it depended on the time I had. I also mentioned that some weeks as it gets dirtier, it gets smaller. Nothing to do with mood. I didn't go as far as to say that every time I wash it- it's an opportunity for me to wear it completely different. 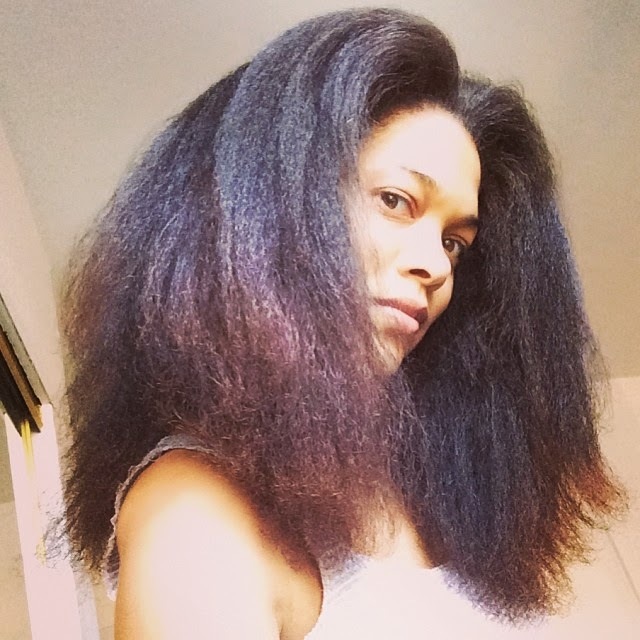 Unlike straight hair that dries roughly the same way whether tied back or loose, I have the option to "set my hair" as it dries, several times a week. The idea of "mood hair" has not left my conscience, however, and today I am in a really bad mood. I woke up in a bad mood, I went to bed in a bad mood. I fell asleep with no scarf and did not care. I got in the shower in the am with only a ponytail holder in my hair, not caring to think about deciding to wet my hair or not. I then just took the elastic out of my hardly damp hair, slobed a rough fingerfull of shea butter on the ends(out of habit) and left the house. Fro flying, no shape, wearing a one piece, ethnic printed dress. I had the tune "Jimmy crack corn and I don't care" turning slowly in my mind. I got on the bus and decided to pull it back, a little, with the same lonly elastic that was around my wrist from earlier. 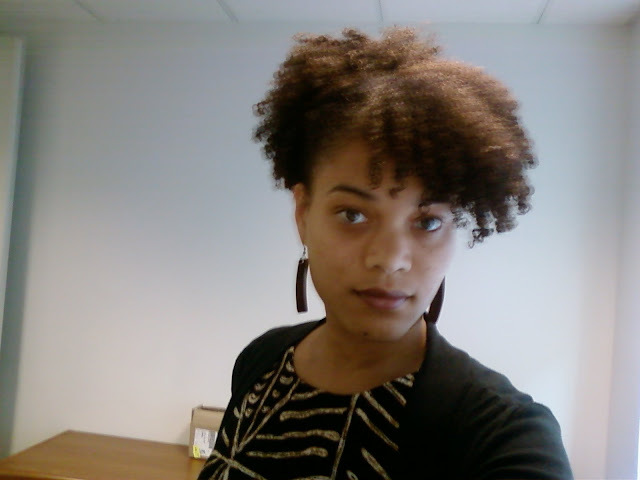 As I manipulated my hair I began to care a little more and checked the mirrow for the shape of the fro. It was fine. I took a "bang" out and sprayed it with some water/goodstuff mixture I often carry in my purse. When I got to work, the old conversation about the bad mood came back to mind when I saw my boss. "Ha" I thought. "I wonder what they would think today"- particularly if I didn't pull it back at all. Then I felt bad. Was I indeed being insensitive by tormenting the "straighthairs" with undecipherable hair messaging? It was a funny and unrelayable thought. So many of my aesthetic hair ponderings are. Here was me by the end of the day after some further coaxing of wildness. I certainly would not have bothered if I had not been at work.